Welcome to ADDISS, The National Attention Deficit Disorder Information and Support Service. We provide people-friendly information and resources about Attention Deficit Hyperactivity Disorder to anyone who needs assistance - parents, sufferers, teachers or health professionals. Whatever you're looking for in ADHD, we'll do our best to help. This website contains just a fraction of the information that we have on ADHD. If you would like to know more, visit our Bookstore. It has a wide range of resources about all aspects of ADHD and associated conditions, with special sections for parents, children, teenagers and professionals. If you would like to talk to someone about ADHD, telephone us on 020 8952 2800, or you can send us an e-mail if you have any questions or need more information about anything you see on this site. ADDISS is a proud member of ADHD Europe, an organisation founded to advance the rights of, and advocate on every level throughout Europe for people affected by AD/HD and co-morbid conditions in order to help them reach their full potential. We now have a dedicated page listing several ways you can help support us in our work. Please follow THIS LINK for more information. The theme across Europe is Women and Girls with ADHD. NICE released a statement saying that the new guide lines on ADHD will recognise that there is under diagnosis in women and girls who very often get missed. Our special guest speaker at our conference was Dr Ellen Littman. Above is our autumn newsletter which includes an article by Dr Littman. WE are making this newsletter available to all. A NEW WAY TO SUPPORT ADDISS... THAT COULD EVEN SAVE YOU MONEY! We are pleased to announce a new and exciting way to support ADDISS that won't cost you a penny. In fact, it could even save you money on your online shopping! We have partnered with Savoo who will donate to ADDISS every time you search online via their website. In fact, you can make it even easier by making "https://www.savoo.co.uk/#addiss" your default search engine! It's totally free, and would help us a great deal. All you have to do is follow this link, click "Support this cause", set up a free account, and start searching! Savoo is also a great way to save money. If you visit Savoo, click "Support this cause", and set up an account you can find voucher codes for hundreds of your favourite shops including Boots, John Lewis, Amazon, and many many more. Every time you use one of those voucher codes Savoo will donate to ADDISS, and you will save money on your shopping! WHO'S IN CHARGE AT YOUR HOUSE? Put Yourself back in control. Train your child to do what you want them to do. Easy to follow steps for disciplining without yelling, arguing or smacking. proven successful programme. The 1 2 3 Magic programme is highly recommended by ADDISS as behavioural intervention for children with ADHD and other challenging behaviours. We have now trained over 200 practitioners to deliver this programme to parents in the UK. Please contact us to find if there is a group running near you. Buy the 1-2-3 Magic Book on-line now for £13.50 including Postage and packing. 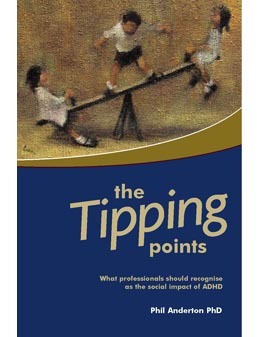 What professionals should recognise as the social impact of ADHD. Retired police officer Phil Anderton brings us a unique book looking at how young people with poorly managed ADHD are at risk of following a path into crime, substance misuse, anti-social behaviour and personal danger, and outlines ways to reduce those risks with easy to follow and pragmatic text and checklists. The book, the first of its kind also has advice for magistrates and the police when coming into contact with these young people. "As an adult who has ADHD, from childhood, and I have had my fair share of issues with the police and courts as a consequence, I really appreciate the interest in this subject being taken by Phil Anderton. This book should be read by anyone and everyone who deals with youngsters who have the disorder, if the people who looked after me had recognised my Tipping Points and done right by me, I might not have the criminal record that I have." "Many books seek to promote awareness of ADHD among the public but very few do so with as splendid a combination of science and compassion as does Mr. Anderton in this up-to-the-minute summation of what parents and others should know about ADHD and its management." "This book is very welcome  it takes the lessons from the scientific study of ADHD and applies them to a social and justice perspective. It deserves to be read widely, especially by those who doubt whether the individuals vulnerability of ADHD is relevant to how society should react." "Phil Anderton, an experienced police officer, has seen that many who get in trouble with the law have ADHD. In this book he clearly describes what ADHD is and makes very practical suggestions for how those with ADHD can be powerfully helped by appropriate treatment. His approach is sensible, compassionate, and desperately needed." You can help raise funds for the national ADHD Charity ADDISS. At the same time you will be helping to raise awareness about ADHD by purchasing our Shopping Trolley Token Keyrings and/or the National ADHD Charity Wristband. Maybe you'd even like your own personal ADDISS Stress Brain! Click the picture for larger images and order details. JUST IN! The New ADHD Jewellery is now on sale. 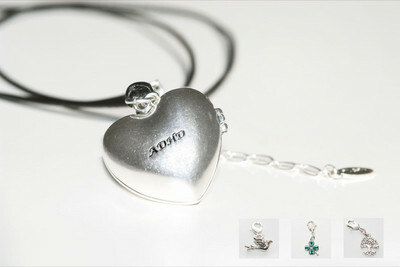 Beautifully crafted jewellery made specially for the ADHD Community. Click on the photo to visit our products page to see a larger picture. Please give your support and help to raise much needed funds by making a donation to ADDISS. We have now teamed up with Just Giving.com to create a secure method for making donations to ADDISS or for raising funds through various events.